The warrior princess and the rogue pilot! 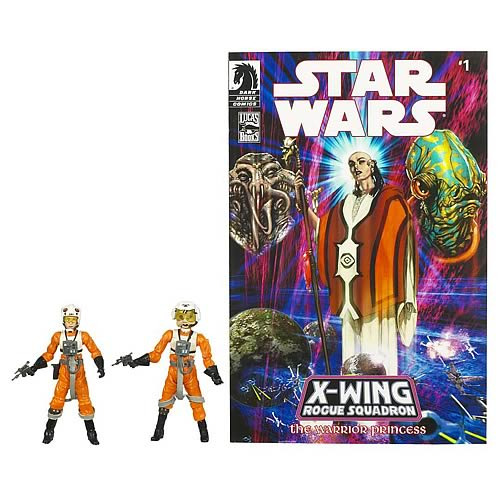 Star Wars action figures from the pages of the X-Wing Rogue Squadron comics. Full-size comic book reprint, blasters, and removable helmets included! A Shared Exclusive! She's a warrior princess from the planet Eiattu VI. He's a rogue pilot with a flair for music and a hint of the dark side. Together, they fight evil. Continuing the run of awesome Action Figure Comic Packs, this set brings two fan-requested Rebel pilots from one of the longest-running Star Wars comic book series of the 1990s! These 3 3/4-inch figures sport loads of detail on their orange flight suits, and each is fully articulated with 14 joints. Includes a full-size comic book reprint, blasters, and removable helmets. As an added bonus, Plourr Ilo has a working holster for her blaster!